..and I'm really pleased with how this came out. and some pink, blue and cream bunting. embossed the edge of the card and added a few little punched butterflies. Great card, love the way you have included the number in the heart Tatty Ted is holding. No wonder she loved it! Really pretty card and a great idea to put the number there. Such a cute, pretty card, I'm not surprised you were pleased with it - its lovely. Really cute card. Love the image and the banner and numbered heart look fabulous. 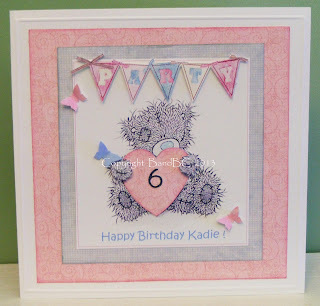 Gorgeous card, love that tatty teddy image, so sweet. This teddy is darling! I love the fluffiness look it has! Gorgeous baby card, I love the other cards you've made recently, too.